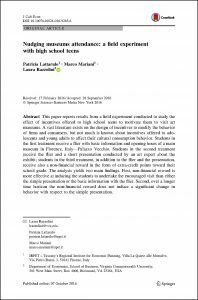 This paper reports results from a field experiment conducted to study the effect of incentives offered to high school teens to motivate them to visit art museums. A vast literature exists on the design of incentives to modify the behavior of firms and consumers, but not much is known about incentives offered to adolescents and young adults to affect their cultural consumption behavior. Students in the first treatment receive a flier with basic information and opening hours of a main museum in Florence, Italy—Palazzo Vecchio. Students in the second treatment receive the flier and a short presentation conducted by an art expert about the exhibit; students in the third treatment, in addition to the flier and the presentation, receive also a non-financial reward in the form of extra-credit points toward their school grade. The analysis yields two main findings. First, non-financial reward is more effective at inducing the students to undertake the encouraged visit than either the simple presentation or the basic information with the flier. Second, over a longer time horizon the non-financial reward does not induce a significant change in behavior with respect to the simple presentation.